Having a sound understanding of the optical geometry is essential as it has a big impact on your color measurement result. To determine which geometry best fits your application needs, it is necessary to understand how each of them illuminates and detect object color. Below we describe the two common geometries built within color measuring instruments. 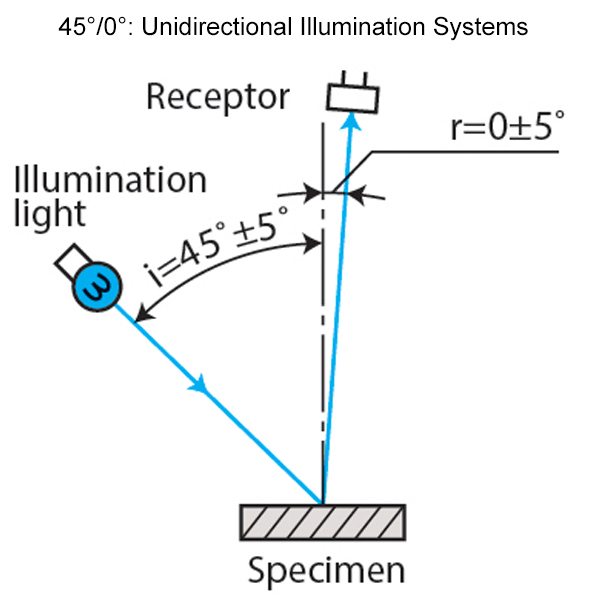 45°/0° or unidirectional illumination systems illuminate an object from the angle of 45° and detects the reflected light at 0°. This type of geometry correlates with visual perception and is used to measure the appearance of sample as they are sensitive to surface conditions. A glossy surface will appear darker than an object with matte surface, even though both are dyed with the exact same color. For product assembled using materials with different surface textures, using the 45°/0° geometry can help maintain consistency in their appearance. 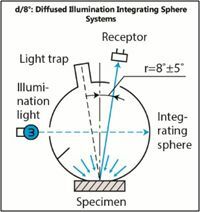 With “d” referring to diffuse, d/8° or diffused illumination integrating sphere systems illuminate an object equally from all directions or angles and detects the reflected light at 8°. This type of geometry is capable of performing measurements in either Specular Component Excluded (SCE) or Specular Component Included (SCI) mode. They are ideal for measuring a sample’s “true” color and also their appearance. This type of measurement geometry is used for color formulation and ensuring color consistency in samples with different textures. Konica Minolta Sensing offers a broad range of color measuring instruments that caters to different needs. Write or contact us at 6563 5533 to speak with our color specialists to understand which type of measurement geometry best fits your application needs.